Ok from the what i can tell of the picture, it seems that your water bowl is on the opposite side of the heat lamp. You need to move it to the middle and you need a bigger water bowl. Once in the middle, let you humidity settle then adjust the water bowl towards to raise humidity And away from the heat lamp to lower. Also what watt size heat bulb do you have in the heat lamp? You would probably would not want to go any higher that a 50 watt ans really,may need a 25 watt. Here is a pic of my old 46 gal bow front aquarium that my pb was in. I work a 48 hour shift and so i had to figure out how to keep the humidity up without having to mist. To do so i got the big corner water bowl and it worked. I did however lose space as the bigger water bowl took up about a 3rd of the tank. I have a hide on the cold side and the hot side. Also if you have a lowes or home depot near by, they have ir temp guns that you can use to check your temps. Last if you can see it in the pic, i have a acurite thermomter from walmart. It has a probe. Probe goes on hot side and the unit goes on cold side. It will give you the temp on each side and it also does humidity. $12 @ walmart. I have two water bowls, the little rock looking one and a much larger one in the middle. The one in the middle is just a little bit to the left of the lamp. Would getting a red bulb help at all or does that not make a difference. This is a better picture of what's on the bottom. Last edited by Hailey_A; 08-30-2014 at 04:04 AM. I would say get rid of the 2 bowls and get one bigger one. Also a hide for the cold side. As for the bulb, what are you using now? You need a red infrared bulb for the heat lamp. A light bulb on 24 hours will stress your snake. They need a dark period of time. Regular lighting is for us to see them but they can be stressed out with it left on for long periods of time i believe. What gallon size is your tank? You probably only need a 25 watt red bulb. Oh if you can tell in my pic, i took black construction paper and double sided tape and taped 3 sides on the outside of the tank. 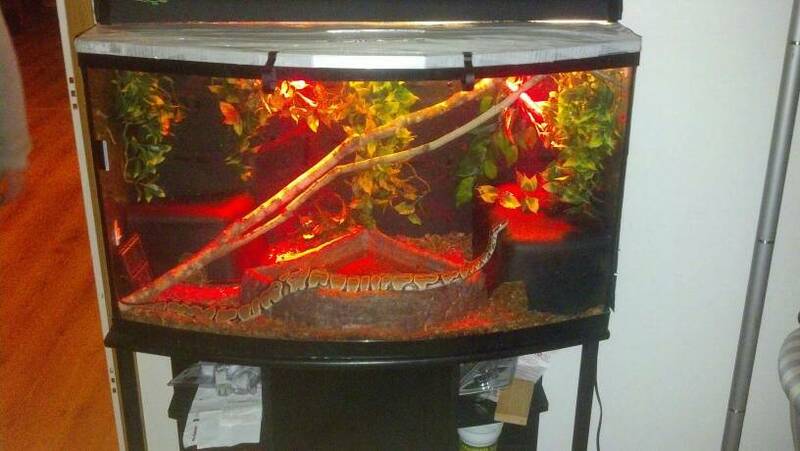 This helps the snake feel more secure especially if the tank is in a high traffic area of the house. Do you have/use a under tank heater (uht)? Hm, ok. And I have a hide on the cool side. The bulb I have now is a 50 watt but it's white. I'll get a red one. The construction paper sounds like a good idea. And yes, I have an under the tank heater. Let me know on how the red bulb works when you get it. Do you have any kind of thermostat controlling your uth? Yeah it's a hydrofoam something thermostat. It's sitting at about 91. Great info thanks for the price scale especially. It's not really required for most snakes. That said I light all of my cages with 18" ZooMed Nature Sun 2.0 full spectrum linear fluorescent bulbs. I decided not to include it in this thread as it is meant to just cover the basics. Depends on how you keep your home heated/cooled. More than likely you will need to keep it on 24/7. The enclosure needs a hot and cold side. Check out the care sheet thread for the temp ranges.